The appearance of the Northern Lights (Aurora Borealis) on the Holy Island of Lindisfarne doesn’t happen every year, but when it has a chance of making an appearance, there is usually some warning a few days ahead. If you live in Southern England, you could always check the likelihood on the day, and hop on a train (3h30m to Berwick) to get here. Worse case, if the Aurora doesn’t appear, you’ll still have an opportunity to spend a day on the beautiful Holy Island and see the Castle and Priory. 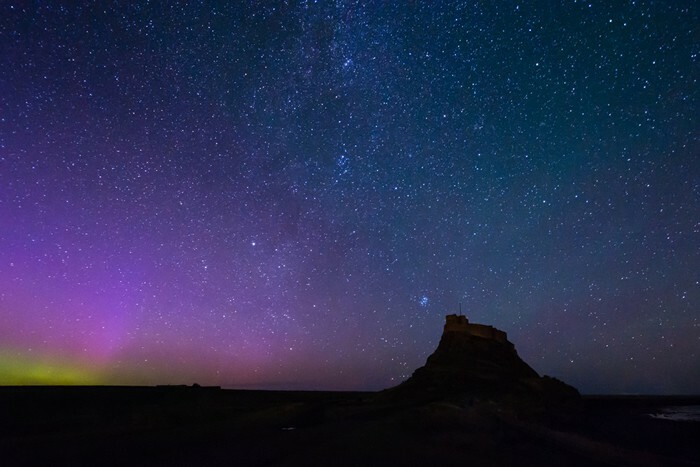 Bearing in mind that Holy Island is close to the northernmost town in England (Berwick-upon-Tweed), and has virtually no light pollution, it’s one of the best places in England to see the Aurora, especially as it appears over Lindisfarne Castle or reflects in the waters of the causeway. There are some absolutely astounding pictures of it from previous displays. After we moved to the Island, I was excited about living in a place where the Northern lights are sometimes visible, and researched how I could have early warning, and what would affect the chances on the day. Here I’ll share with you what I learned. When is the best time to view the aurora in the UK? Between September and April, after dark. Your first point of call should be the forecast page of the Aurora Service website. At first it might look a little confusing, but unless you are already on location and it’s night, ignore the fancy map (because it shows you likelihood of an aurora now) and scroll down to the three-day forecast (today, tomorrow and the day after). Now look at the three-day forecast numbers for the hours after-dark. The likelihood of seeing an aurora on Holy Island is increased as soon as the numbers hit the range between 5 and 6 or higher. Although a 5 indicates a good chance for Northern Scotland and a 6 is a higher likelihood for us here, predictions for solar storms are not an exact science, so as soon as 5 is reached, there’s always a chance it will spike up and we’ll get a Northern Lights display in Northumberland. The next thing you’ll want to check is the weather forecast. There are two more conditions that need to be met: 1) the sky should be clear of clouds, and 2) the moon should not be too full, or its light might be too bright for an aurora. If the numbers are high and the sky is clear of clouds and moon, is an aurora guaranteed? In a word: no. Aurora forecasting is improving, but is not perfect, and it takes a good confluence of events for it to be visible here. Can I get alerts of potential Northern Lights displays? Yes. The Space and Planetary Physics group at Lancaster University’s Department of Physics offers a free alert service for when the Northern Lights might be visible from the UK. Note that their alerts are usually at the time of increased solar activity (i.e. when, or just before an aurora is expected), so if you are planning this from a distance and you are not onsite, then you might want to check the Aurora Service three-day forecast I noted above. I’m also going to highlight exceptionally high forecast when I see them on our Twitter feed, so you may wish to follow us.